It’s now the time of the DC-verse. DC’s “Aquaman” succeeded because Jason Momoa finally learned how to act, embracing the full range of his manly goofiness (as demonstrated by the fame now accorded his Oscar ceremony pink-suit accessory—a pink scrunchy), and because of his chemistry with Amber Heard. “Aquaman” also stole the theme music from “Braveheart,” which made it a little bit epic. That’s my take on the “Aquaman” recipe for success, in a nutshell. 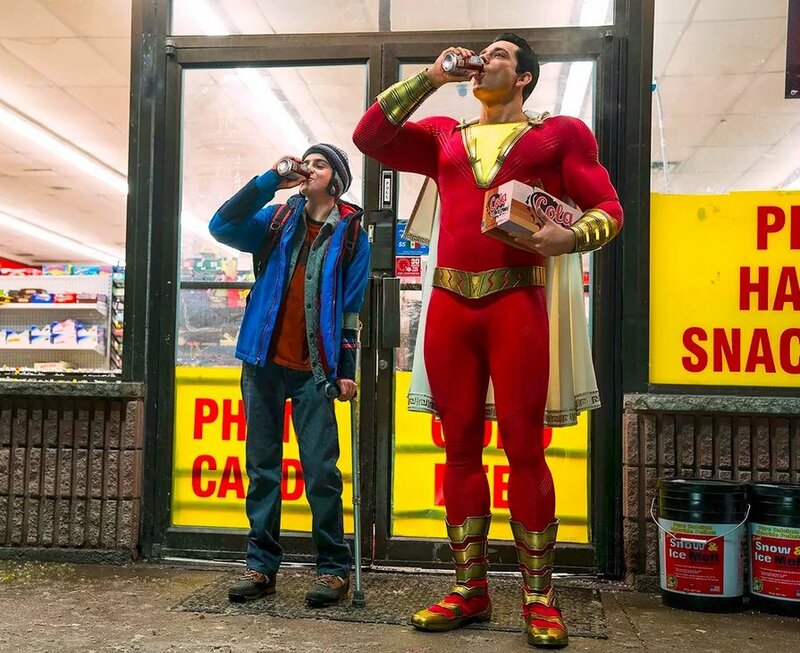 The rather fun “Shazam!” also displays the apparently unavoidable, low-rent kitschiness of the DC universe. And, like “Aquaman,” it’s definitely got major franchise potential, due to having tapped into the same vein of Americana that the first “Transformers” did: teens running around, figuring out how to harness powerful machines. Here, they figure out how to harness superpowers. Billy Batson (Asher Angel) is an irreverent, moody, 14-year-old foster kid whose mom allowed him to get lost while at the local carnival. He skids from one Philadelphia foster home to the next; he’s on an eternal quest of “Are You My Mother?” It’s the same as the lost robin chick who fell out of his nest in the children’s book of that name. 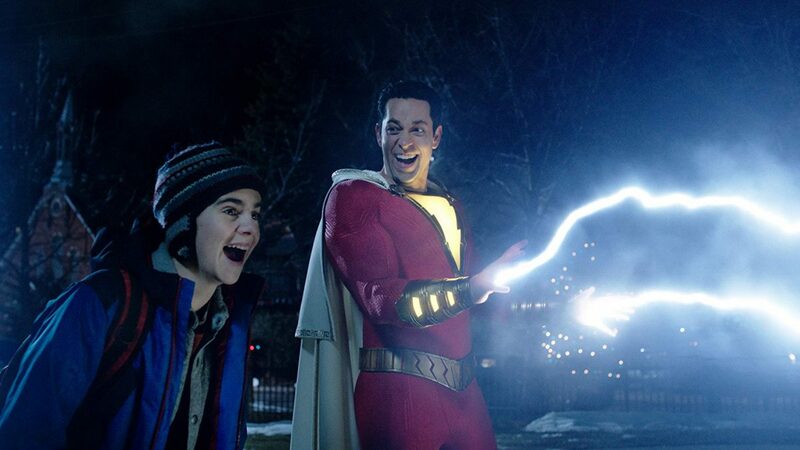 Billy’s eventually gonna turn into the “Shazam!” dude. 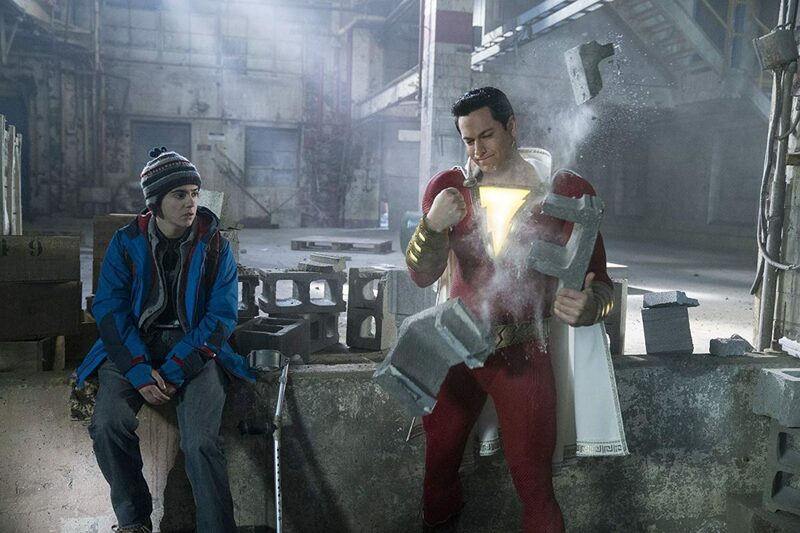 But first we have to deal with the silliness of the origin of the “Shazam!” superpowers: In an other-dimensional grotto, there’s a wizard (Djimon Hounsou in a Gandalf beard), surrounded by monolithic statues depicting the seven deadly sins (Pride, Wrath, Envy, Sloth, Lust, Gluttony, and Greed). What do you think this elder is up to, sitting around in his cave for who knows how many thousands of years? He’s waiting to find someone to carry on his legacy. It must be an individual with a pure heart. Meanwhile, there’s another, different kid with a bad childhood, who grows up to be a bad man and manages, at some point, to steal much of the cave-dwelling elder’s power, which frees the sin-demons from their statues. They then reside in the bad man’s soul as gray mist. He can call these rotten demons forth to manifest at will. 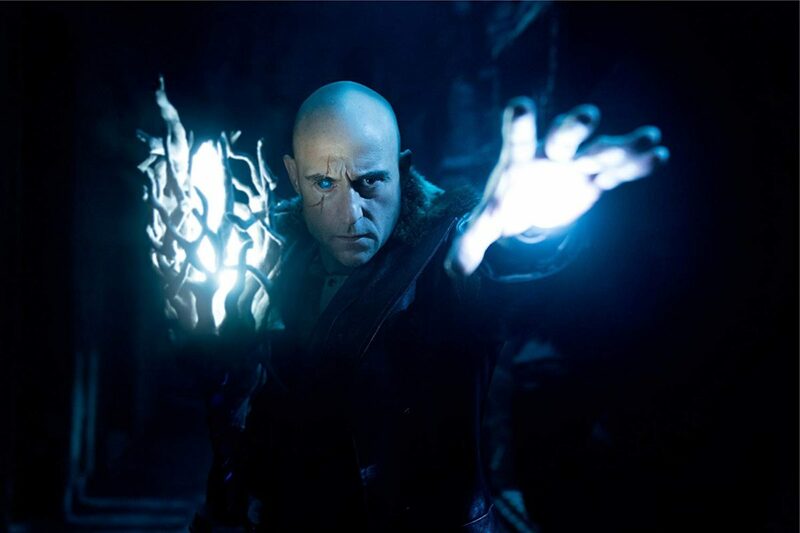 He’s Dr. Sivana (Mark Strong), and he’s going to spend the rest of the movie chasing the pure-hearted, chosen one around, to steal the last of the Shazam power. Sivana must be stopped, of course. 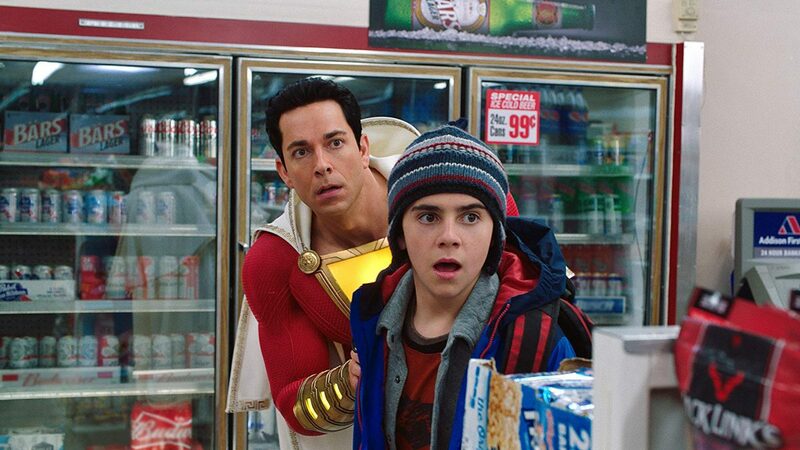 So now, Billy Batson (the good kid—remember the good kid?—this movie is about the good kid), who’s finally found a good foster family, stops by the Shazam cave to be deemed worthy. How does he get there? It’s a long story, because, well, it’s a long movie. And now Billy suddenly discovers he has the ability to morph into a grown man, looking like a prettier version of Hans and Franz of “SNL,” in a maroon superhero suit with a yellow lightning bolt on his chest, all paaahmped-up. How does he transform? He shouts the name of the movie, of course. But first we have to talk some more about his family. 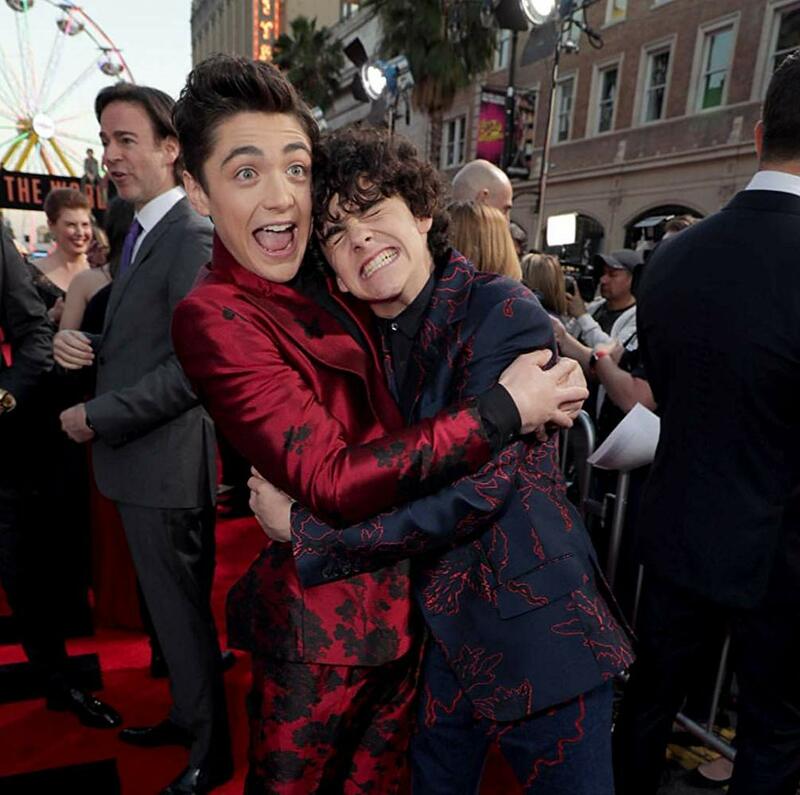 Because it’s really young Jack Dylan Grazer who’s the heart of this movie. He plays Billy’s foster brother Freddy Freeman, who walks with a crutch but is a bravura, virtuoso motor-mouth who toggles between total smart-aleckness and endearing vulnerability. He’s the sidekick that makes the whole movie work. He’s going to make a whole lot of movies work. They run through a checklist of powers: bulletproof (the suit’s bulletproof—but is his face?! 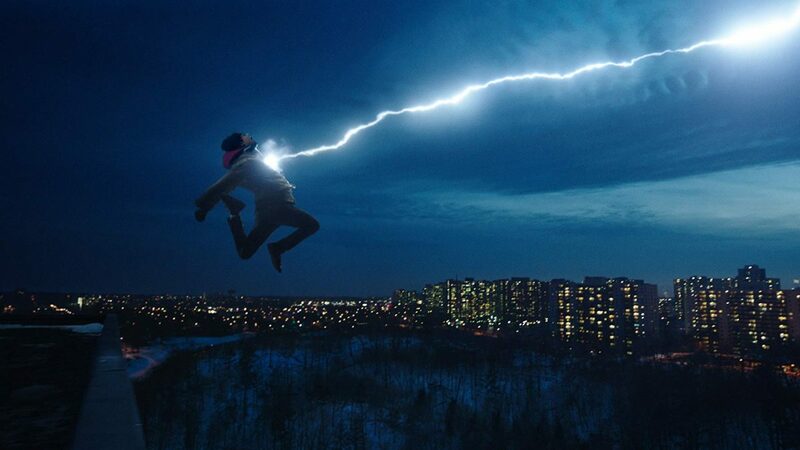 ), flying, zapping stuff, super strength, running fast like the Flash, and so on. Being current teens, they’re extremely facile with social media, and so the testing and recording of powers ends up on YouTube and Instagram, naturally. By the way, they also need to come up with a good superhero name. “Captain Sparklefingers” is one of the discarded attempts. This is what the movie does best: It puts you in a teen’s mind—an underprivileged, bullied teen’s mind—and lets you feel how phenomenally, mind-blowingly exciting it would be to suddenly have the powers with which to resoundingly smack every bully in the world upside the head. 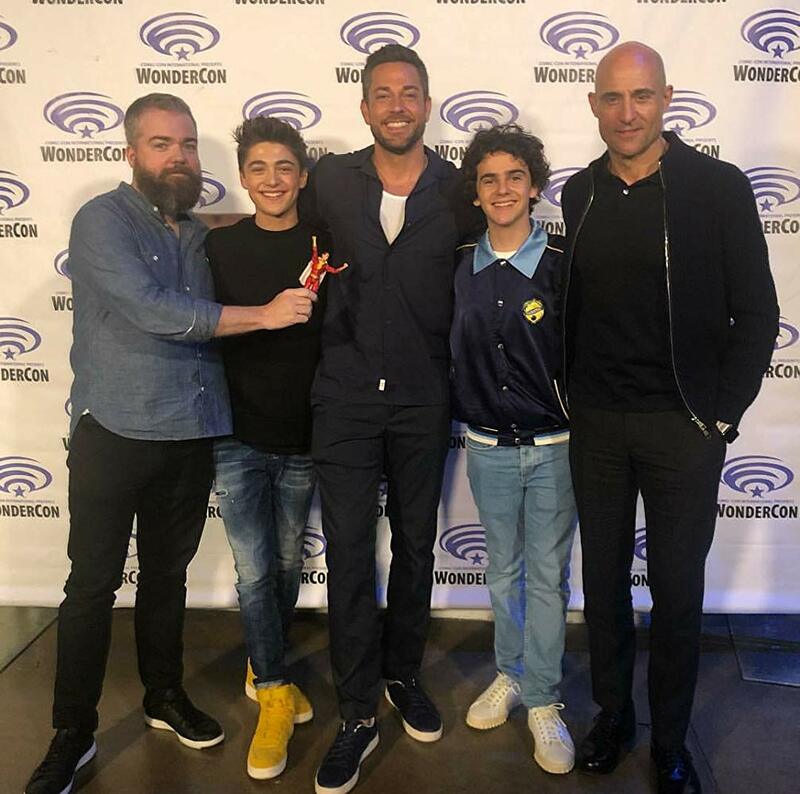 Shazam/Billy will eventually resolve his abandonment issues and learn to appreciate how ridiculously lucky he is to have landed the best foster parents in the world (Cooper Andrews and Marta Milans) and most awesome siblings (Faithe Herman, Ian Chen, Grace Fulton, and Jovan Armand). 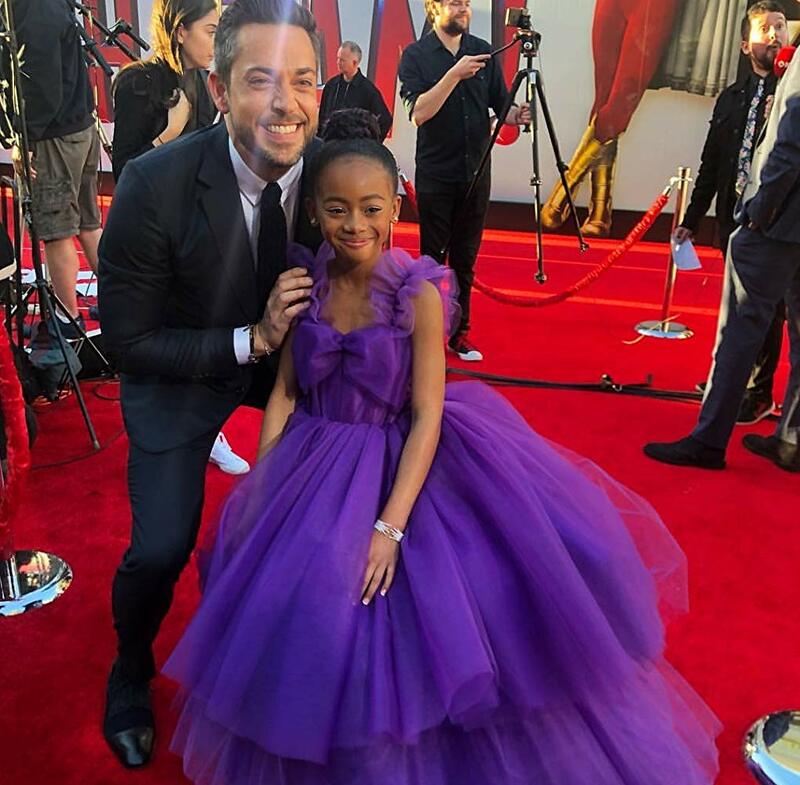 Look for teeny Faithe Herman to have a prolific child-actress career after this. Now, it must be noted that director Sandberg is a horror guy (“Lights Out,” “Annabelle: Creation”), and the residue of that mindset shows up here. Normally, it’d be too terrifying for tinys, but per the DC way, the CGI is just seriously behind the curve and not convincing. More gross than scary. There are two current takes on what needs to be done about the ridiculously profuse glut of superhero movies: It’s either “they need to be more serious!” or “they need to lighten up!” Actually there’s a third take: “They need to go away altogether!” The latter’s not gonna happen anytime soon. They make too much money. The problem is that because it’s superhero and comic-book movies all the time now, there’s only so much innovation that can happen. Eventually, when everyone’s endlessly bored and the money goes away, the superheroes will go away too. For now, enjoy this lighter fare.